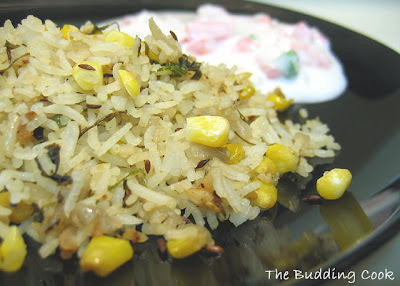 I love corn-methi pulao but only make it occasionally. Recently, I saw this on Raaga’s blog and decided that it was time I made some again, especially since I had a lot of rice left over from the previous day. I normally use frozen fenugreek/methi leaves for this recipe, but did not have any this time since I’m in the process of cleaning out my freezer. I substituted it with some kasuri methi. Just keep in mind that while using kasuri methi, a little goes a long way. Heat ghee in a large pan. Add the bay leaf, cinnamon stick, cumin seeds and the spice mix followed by the chopped onions, ginger, garlic and green chillies. Sauté till the onions are translucent. Fish out the bay leaf and cinnamon stick. Add the kasuri methi/dried fenugreek leaves and cook for 3-4 minutes. Add the frozen corn to this and mix well. Cook until the corn has thawed in the pan and the water content (from the frozen corn) has evaporated. Add the cooked rice and mix well. Serve hot with raita. Oh, this is a wonderful combination. Sweet corn and the slightly bitter methi. Guess whats in the freezer..thank you. What a lovely idea! I have both frozen methi and the kasoori stuff to give this a try. Thanks! That looks like a lovely combination TBC. Pretty too. new camera? pics looking really good!